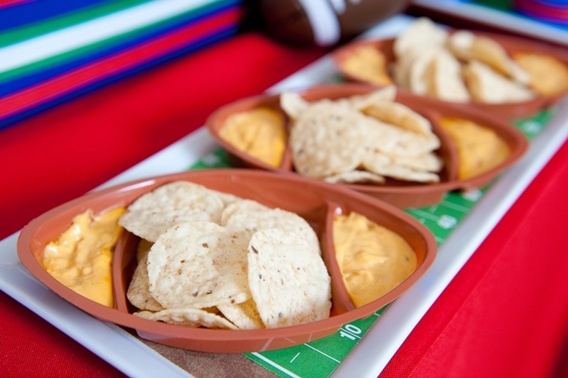 Today we are featuring an amazing Super Bowl Party guest post from Sandra Downie of Sandra Downie Event Designs and The White Library. 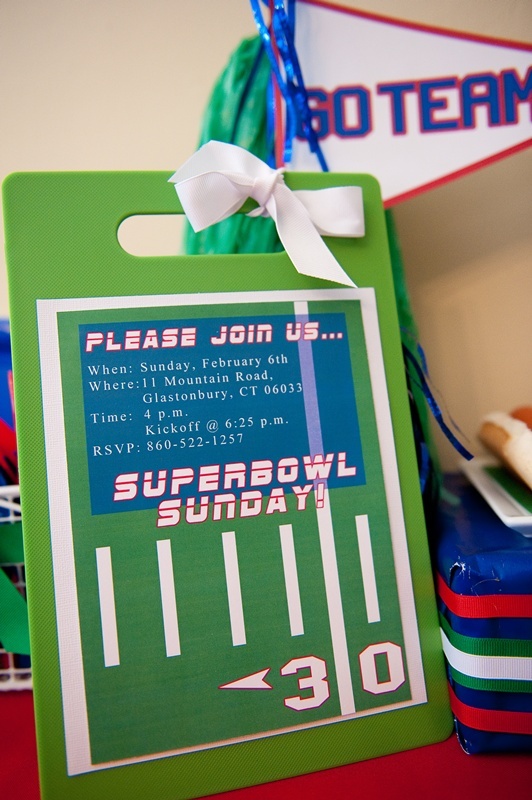 Take a look at what Sandra has to say about this fabulous party that is perfect for Super Sunday: We had so much fun designing this Super Bowl party here at Sandra Downie Event Designs. Since we did not know what teams would be in the Super Bowl, we wanted to design something that would work for anyone (and any team) on game day! 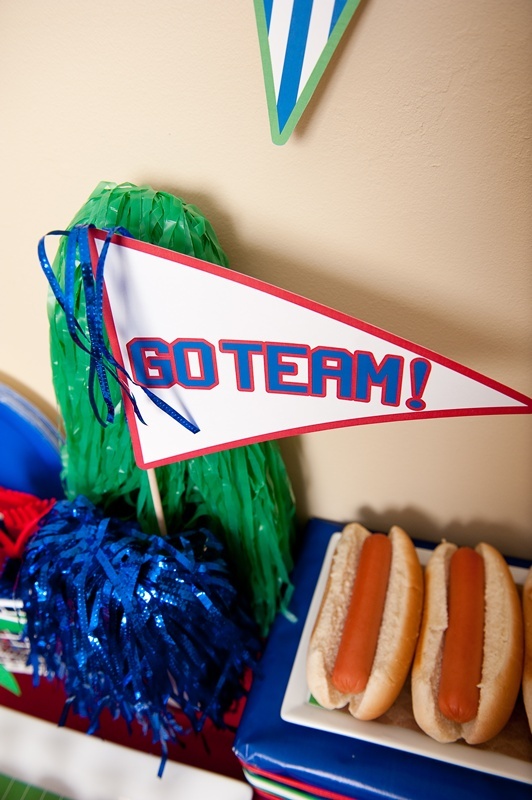 You can take inspiration from our party and tweak it with the appropriate teams by adding logos and pennant flags to the designs. This party is very easy and inexpensive to put together – we just used standard food that you can quickly pick up at the local grocery store. You may even have a few of these items already in your pantry. Using party printables really helped tie everything together and make the snack table look quite vibrant. We used some pom poms found at our local party store for some added table décor. The bacon mac & cheese bites were easy to make and tasted delicious. I started with a traditional baked mac and cheese recipe and put the scoops of mac and cheese in a mini cupcake pan using a mini melon ball scooper. For the finishing touch, I sprinkled bacon bits on top. If you prefer, you could also add the bacon to the mac and cheese while you are mixing everything together. The invitation was mounted on a mini green cutting board that I purchased at Jo-Ann Fabrics. Creating the cup o’ fries was a fun craft project. I took plastic drinking cups, cut them in half and simply lined the top edges of the cups with coordinating ribbon.. Putting this party together is very DIY and will really make the big day more festive. Go Team! For more stylish entertaining ideas and beautiful event design, visit sandradownie.com. 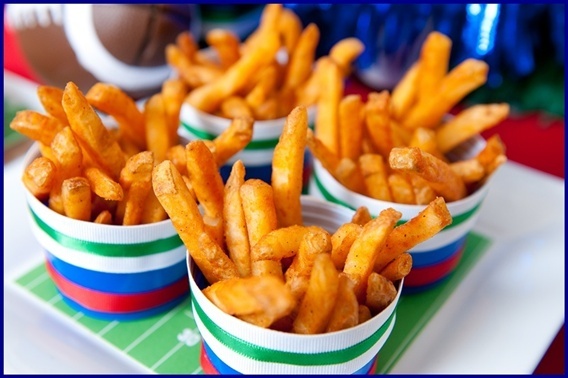 If you are looking for more Super Bowl party inspiration, take a look at a few of our ideas for making Super Sunday an event to remember. 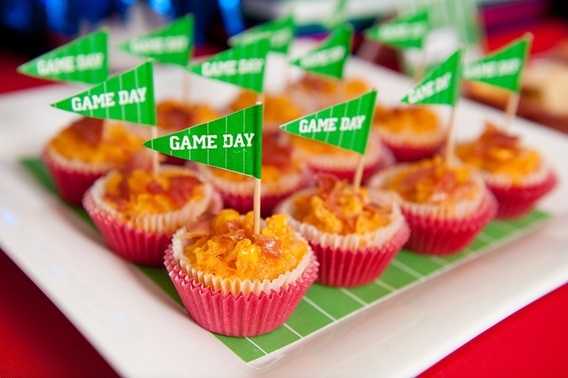 How will you be celebrating on game day? Let us know in the comments below.